Images are now presented in ProView which displays optomap in a consistent geometry that accurately represents anatomical features in the retina. Further, ProView enables automatic image registration for disease tracking over time, and inter-modality image comparison. New proprietary optical hardware optimizes and maintains resolution of the optomapimages throughout the scan of the retina resulting in more clarity in the far periphery. Image overlay enables comparison between composite color images and red-free, af, fa, or icg images. Additionally, comparisons can be made between different images or different dates by scrolling through all stored images. 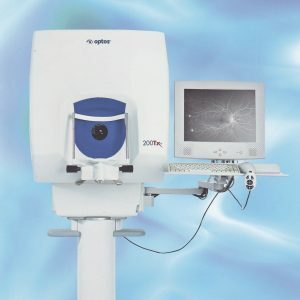 200Dx is a widefield digital imaging device capable of capturing from the far periphery of the retina. The retinal images are captured in an automated, patient friendly way without scleral depression or contact with the cornea. The 200Dx/P200 uses red and green lasers to produce a digital, high-resolution image, which is displayed on a PC monitor screen. Red and green lasers are used for digital color imaging. These laser wavelengths penetrate the retinal structures to different depths, each wavelength providing information for interpretation and diagnosis. 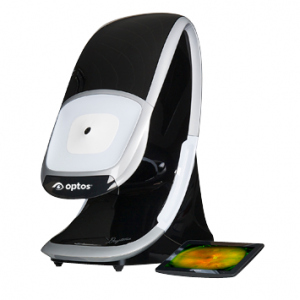 Optos’ technology is designed to operate through a minimum pupil diameter of 2mm. Although pupil dilation is not required, the decision to dilate is a medical decision to be made by the eye care professional. Images are captured on the scan head and then viewed, magnified, annotated and separated into their color components in the review application. 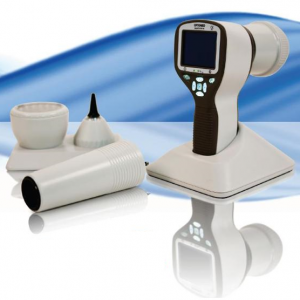 Smartscope PRO camera with Smartscope FA module is a perfect combination of Slit Lamp and hand-held mode providing high quality Fluorescein Angiograms with a wide 40 degrees field of view. 9 internal fixation targets enable peripheral imaging (total FOV 70 * 52 degrees). Smartscope FA is easy to operate and offers fast image capture ability and a detailed view of the entire fluorescein dye circulation dynamics. With a special Slit Lamp Adapter Smartscope FA can be mounted to any Slit Lamp with patient head rest. Wi-Fi enables easy image transfer to PC, laptop, tablet or mobile devices. 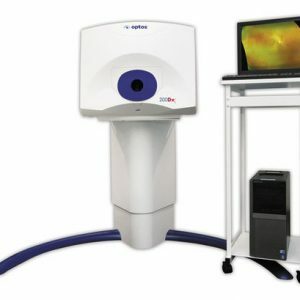 With Optomed Workstation software (sold separately) the images can be viewed, shared and stored locally and sent directly to a DICOM compatible system (PACS or other) of the hospital network. 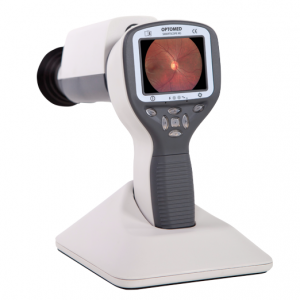 Optomed Smartscope® PRO is the next generation hand-held medical camera that provides high image quality which fulfills international ISO 10940 fundus camera standard requirements. Interchangeable modular optics make the camera even more versatile. The lightweight camera incorporates advanced technology in a portable design. 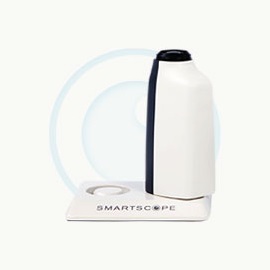 Smartscope PRO camera provides accurate and silent autofocus which makes image capturing quick and easy. The camera is also equipped with Wi-Fi for advanced image transfer to any PC or mobile device. The Smartscope PRO comes with Patient Data Management software (sold separately) with full DICOM and PACS compliance to ensure seamless interoperability with hospital networks and practice management systems. 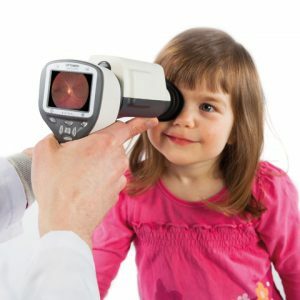 Portable Non-mydriatic eye fundus examination Optomed Smartscope M5 is a digital medical camera that provides general, ophthalmoscopic, otoscopic and dermatoscopic imaging with one hand-held device. This multipurpose digital imaging device weights only 400g and powered with a battery it gives you the freedom to move around and take the device with you to any location. Digital still and video images created with Optomed Smartscope M5 allow making accurate first diagnosis and planning consistent follow-up treatment. 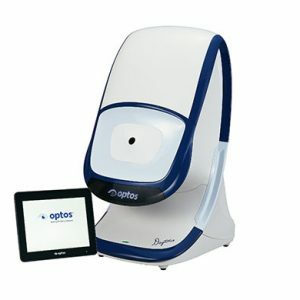 Optomed Smartscope M5 is easily adopted into daily examination routines and connectivity to any patient database system enables fluent image data sharing e.g. for consultation purposes. The device comes with a 2GB SD memory card and pictures can be easily transferred to your PC by placing the device to its cradle which connects to the PC via USB connection. The 5 megapixel sensor and up to 2560 x 1920 pixels resolution guarantee the quality of your pictures. Each of our 4 attachable optics modules has its own light source and adjustable illumination levels. Optics are fast and easy to attach and detach with bayonet connectors. The advances in M5 compared to M3-2 are new sensor enabling improved picture quality, higher battery capacity and keyboard lights that make using the device in a dark room easier. 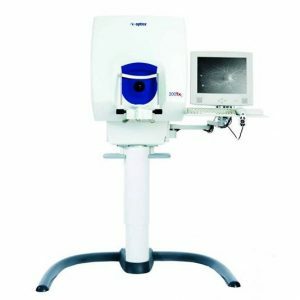 Optomed Smartscope M5 offers non-mydriatic fundus imaging without the need for dilation drops with EY2 and EY3 optics modules.